The Gospel of Joh n opens with one of the most well-known passages in scripture, “In the beginning was the Word, and the Word was with God, and the Word was God.” For crossword “puzzlers,” the passage might be amended to include, “and the word, is also the middle and end-all of pastimes.” The documentary film, Wordplay provides an eye opening glimpse into the world of the crossword puzzle. Even though I have known people who often worked crosswords, the thing that jumped out at me was that for many, crossword is a 9 letter word for “war of words.” Unbeknownst to me there has been for decades a daily war waged between givers of clues and holders of pencils, or pens, with the battlefield a 5 inch square box filled with blank spaces. 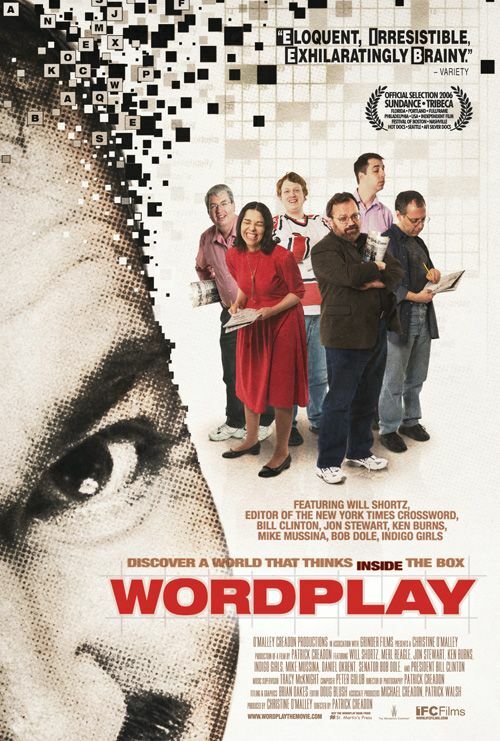 Directed by Patrick Creadon, Wordplay features Will Shortz, the crossword puzzle editor of what is the gold standard for “cross-wording,” the New York Times Crossword Puzzle. Also featured is a cast of characters from leading puzzle constructors to the most devoted of the box hungry consumers. Director Creadon draws back the curtain and offers an extended examination of all that goes into producing what for many is a daily necessity. Who ever knew there were standards for the number of spaces and the patterns for the blackened boxes. While I had heard that Saturday and Sunday puzzles were more difficult, there is in fact a decided hierarchy for the degree of puzzle difficulty. Mondays are the easiest with each day getting harder, building to a crescendo of Saturday and Sunday killers. Creadon also draws the curtain back on the best of the best crossword puzzle players, who keep in crossword shape by timing themselves, to the second, on each and every puzzle. For those who think miracles do not happen, try watching a person finish a NY Times puzzle in 2:02. The film follows these leading puzzle masters as they integrate “puzzling” into their lives and seek to show their wares at the pinnacle event in the crossword universe, the annual Crossword Tournament in Stamford CT. Interspersed with these titans of the crossword world are other more notable devotees from Bill Clinton and Bob Dole, each also the correct answer to a clue on the day after the 1996 election, to documentary film legend Ken Burns, and TV host / comedian Jon Stewart, among others. Wordplay is a wonderfully informative, funny, and engaging film that appeals to persons, regardless of whether they have rarely gotten more than a word or two of a puzzle, i.e. me, or are those that see the rest of the newspaper as filler for the crossword. Whether opening one’s eyes or validating one’s passion, Wordplay entertains, informs and is worth the investment of time and price of a DVD rental or download. If one does engage in the word warfare you will want to view and be in awe of these brobdingnagians of the crossword universe. If one has little or no experience, you should also catch it, and be informed of another of the world’s intriguing corners. I say this based on my response to the film. Upon leaving the theatre I was struck by the diversity of interests and abilities with which God endowed humanity. While I have passed over enough crossword puzzles to wall paper a cathedral, others have availed themselves of them, and been entertained, educated, and exercised their brain. And yet, many of those same persons cast aside film reviews and or the religion or sports sections for later _ _ _ _ _ _ _ . (7 letter word for quickly scanning .) As I exited the theater I was reminded and amazed again by the macro and micro duality of God. God is at once so expansive and diverse in instilling in others such a wide variety of passions, talents, and hobbies, and yet is also absolutely personal and intimate in designing my interests and equipping me with my abilities. The same God, who created the heavens and the earth in all their beautiful vastness, Psalm 8, is the God who created and knows me perfectly, Psalm 139. This entry was posted in Faith Shots, Film Shots and tagged Bill Clinton, crossword puzzle, diversity, documentary film, faith and film, games, god, Gospel of John, hobbies, in the beginning was the Word, independent film, interests, Jon Stewart, pastimes, Preaching, Prologue Gospel of John, Psalms, puzzles, sermons, variety of interests, Will Shortz, Wordplay film. Bookmark the permalink.